Heard of the Detroit Motor Company - no? 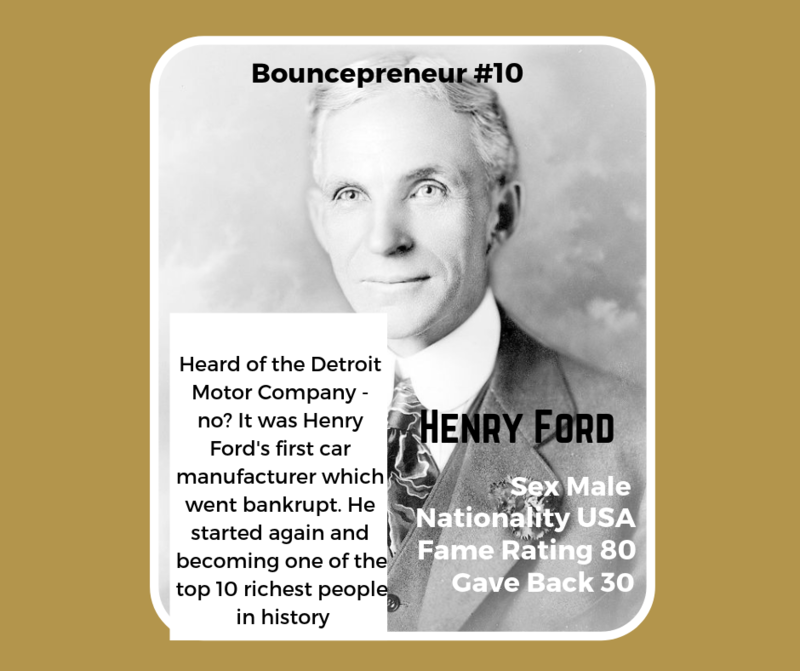 It was Henry Ford's first car manufacturer which went bankrupt. He started again and becoming one of the top 10 richest people in history. So even the mighty have failed. Retired teacher Cheng Shilian is 77 from Anhui Province China. Loss of her husband and debts from treatment of her late son and his wife left big debts. 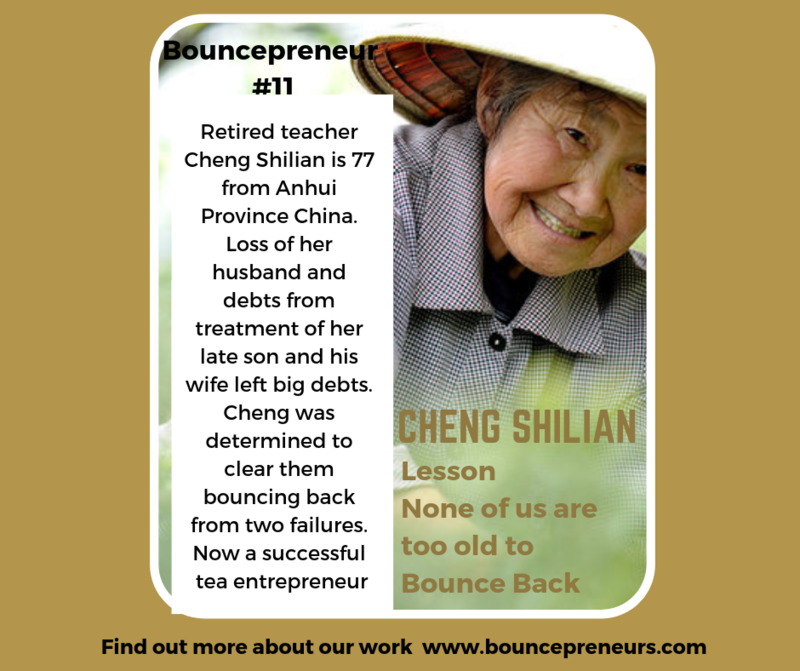 Cheng was determined to clear them as bounce back in business after two failures. Now a successful tea entrepreneur. 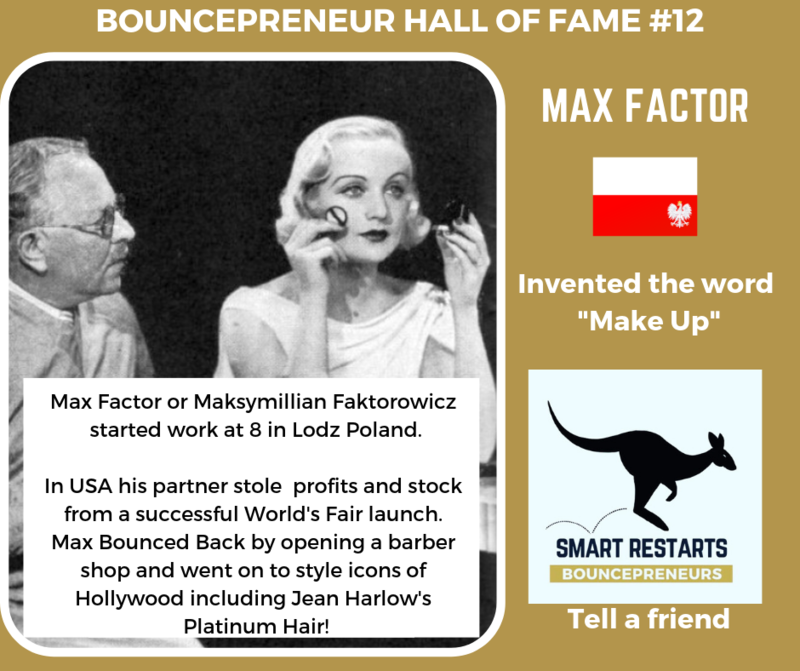 Max Factor or Maksymillian Faktorowicz started work at 8 in Lodz Poland. In USA his partner stole profits and stock from a successful World's Fair launch. Max Bounced Back by opening a barber shop and went on to style icons of Hollywood including Jean Harlow's Platinum Hair! 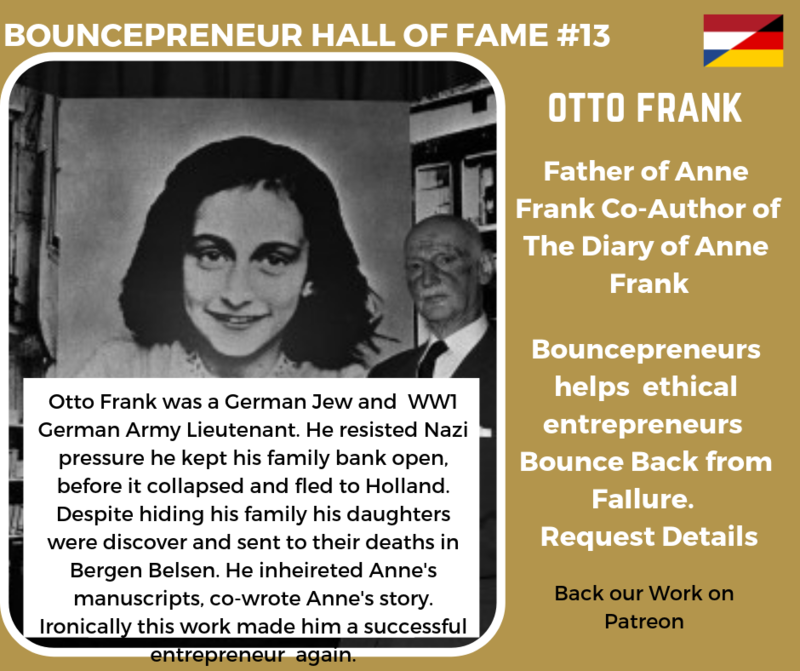 Today we induct Otto Frank into the Bouncepreneurs Hall of Fame . Otto was the Jewish father of Anne Frank . 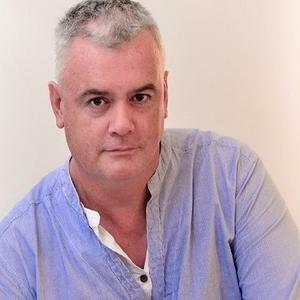 He himself Bounced Back in business in an ironic way co-writing and selling over 25 million copies in 50 languages of The Diary of Anne Frank. Bouncing Back to keep his daughter's memory alive. 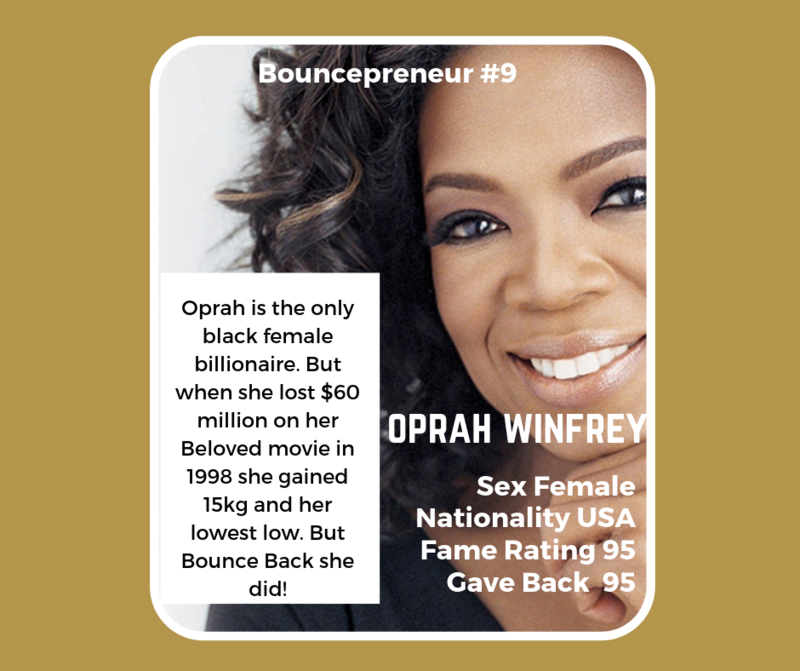 Oprah is one of only two black female billionaires. But when she lost $60 million on her Beloved movie in 1998 she gained 15kg and openly states it was her lowest low. 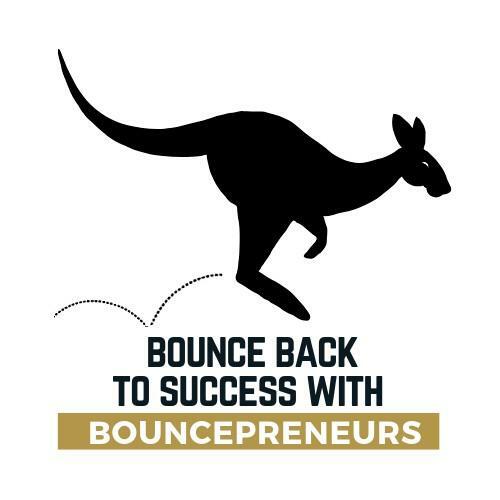 But Bounce Back in Business she did! With millions of dollars of her lingerie en route to South Africa Caprice was put in crisis when they halved the order and her stock was only in South African sizes. She bounced back by licensing her personal brand. 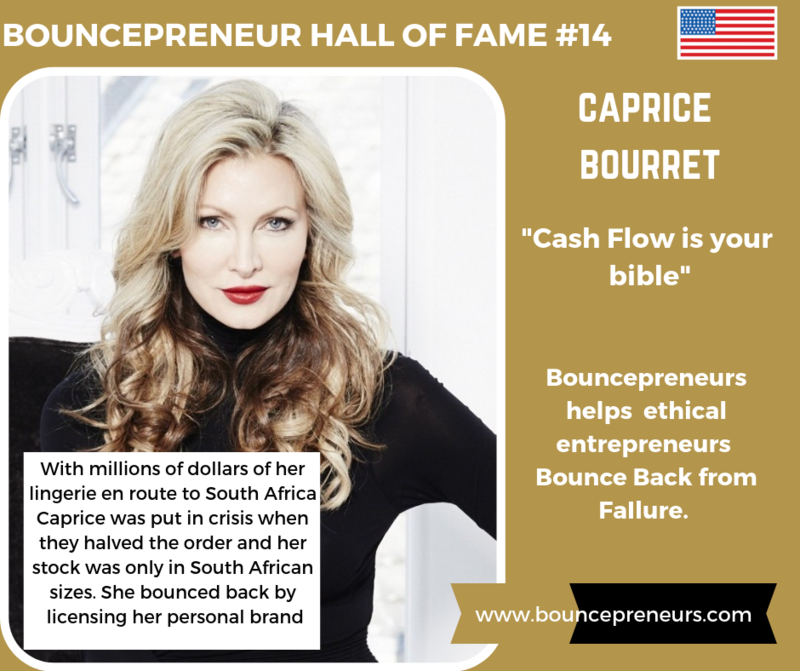 Her advice "cash flow is your bible!" 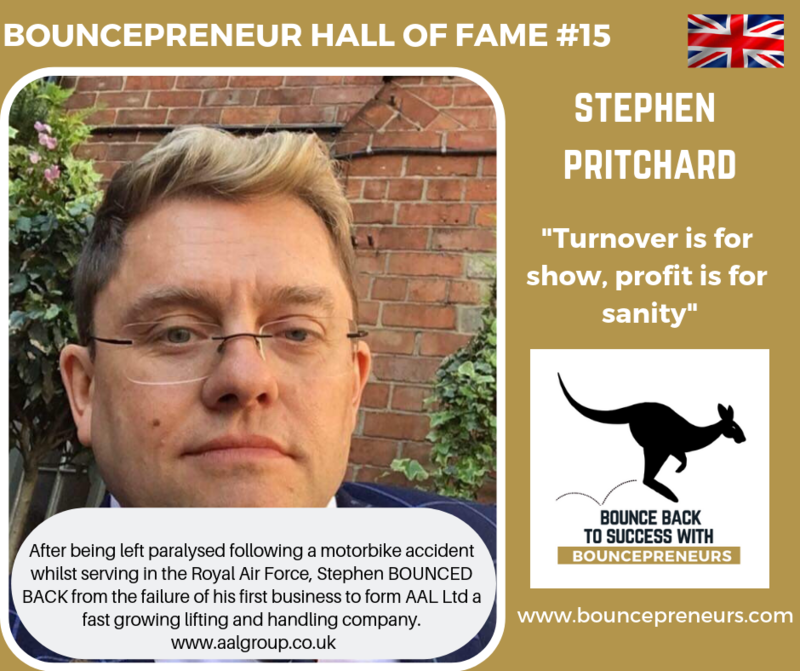 We are delighted to induct our first Canadian into the Bouncepreneurs Bounce Back Hall of Fame. T.Harv Eker is a force of nature, inspiring millions to "change their mind" and think another way. His "Jar System" should be taught in every school. Harv says "When you complain you become a living breathing crap magnet!" Fabio Seixas is and CEO of Camiseteria, a T-shirt online store based on crowdsourced design. However, Camiseteria is not his first try. Fabio has over 20 years experience in Internet startups, and some of his ventures failed. 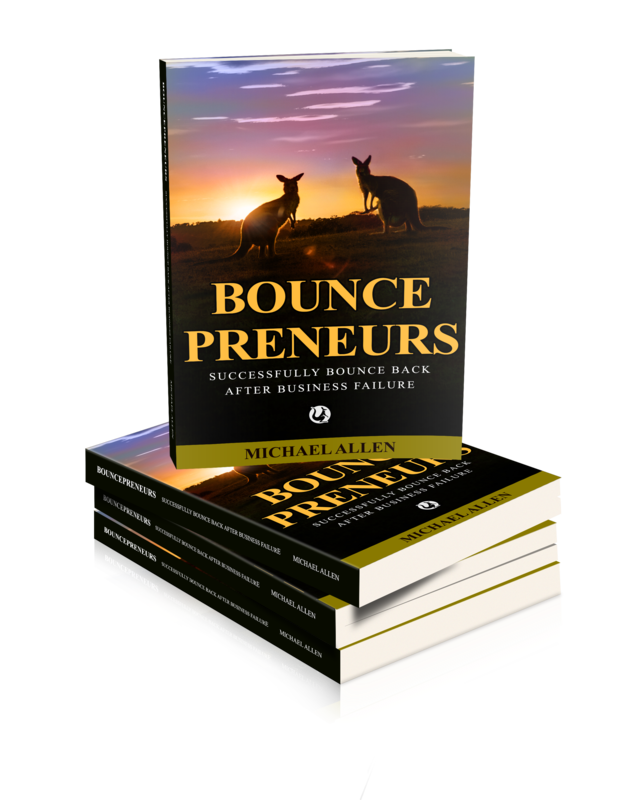 Stands out because his is one of the few entrepreneurs in Brazil who openly talks about it. 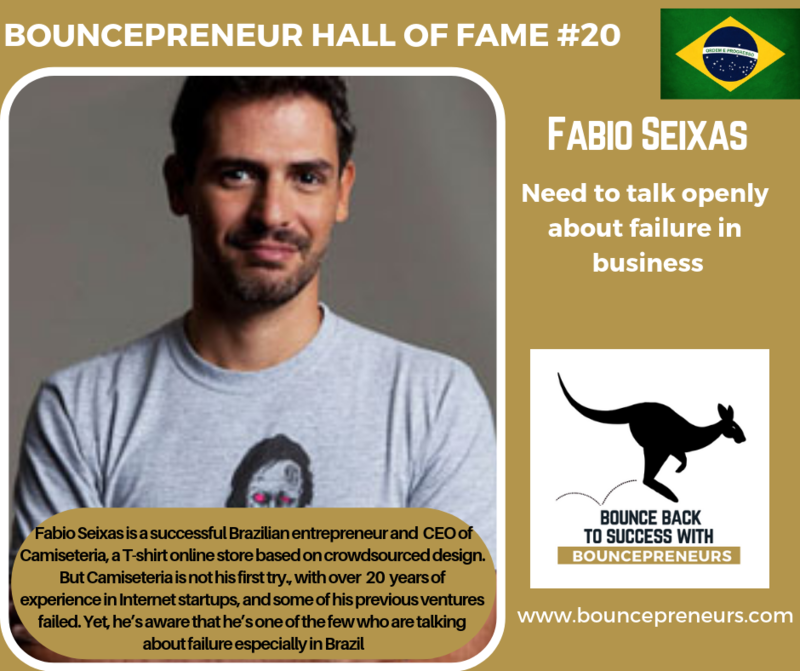 Entrepreneurs need to be comfortable talking about failure - says Fabio.